semiya Upma is a common South Indian breakfast dish. Here is the recipe for this simplest break fast that is semiya upma. In a wide vessel, add a tsp of ghee and toss the vermicelli in a medium flame. After 2 minutes, remove it from the heat before the color changes. Transfer them to a plate and in the same pan, in medium heat, add oil and add the mustard seeds. When the mustard seeds starts to splutter, add the asafoetida followed by the curry leaves, channa dal and split urad dal. When they turn golden brown, add the green chillies followed by the grated ginger and chopped oinions. Fry till the onions become translucent and add all the vegetables. Add some salt and add 1 3/4 cup of water and cover it with a lid. 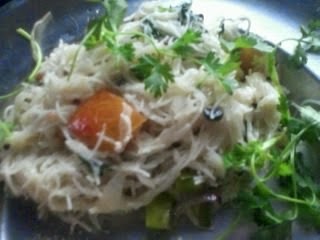 When the veggies are 3/4th done, add the vermicelli and mix well. When all the water gets evaporated, cover the lid and keep it in simmer flame for 5 to 10 minutes or until the vermicelli/semiya becomes soft. that your simaya upma. Serve hot with sugar, coconut chutney or even pickle. Since I am adding around 1 1/4 cup of veggies, I add 1/4 cup extra water. Upma should be removed from the heat before it gets mushy. 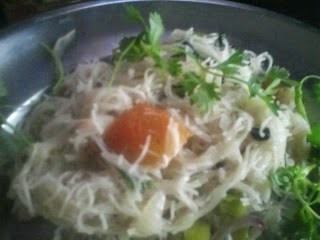 For semiya upma, if you add little extra oil, it will be seen more after it is done.